7559 W Sand Lake Rd. You have probably noticed that "Brunch" has become the cool social thing to do on weekends. You have also probably noticed that lots of restaurants have been making a push to serve brunch over the past year. But I bet when you think of a typical "Brunch", you are not thinking Indian food. 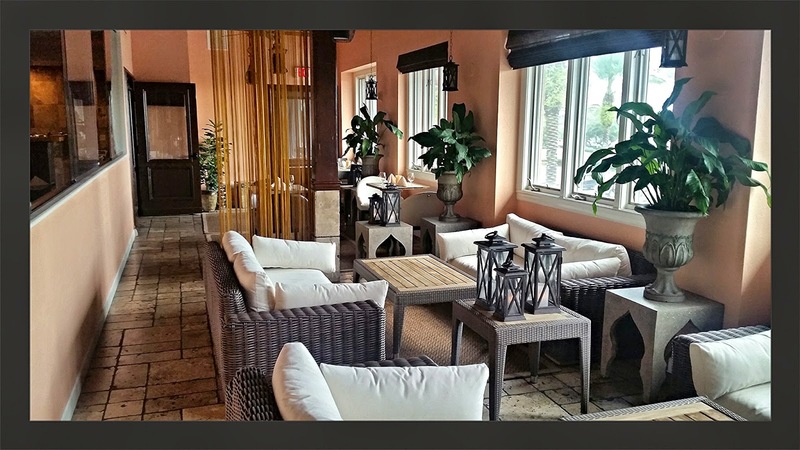 Say hello to brunch at American Gymkhana, the all new modern Indian restaurant and lounge on Orlando’s famed "Restaurant Row" in the Dr.Phillips neighborhood. If you recall, I recently visited there and really enjoyed the food and and just about everything that is American Gymkhana. You can see my review Here, in case you missed it. With the recent boom in the restaurant business that Orlando has had the past few years, the brunch craze soon followed. You have an endless selection of waffles, omelets, bacon, mimosas and biscuits & gravy. Some places have even refined the brunch theme to include extravagant items like Spanish tapas and a gourmet crepe station, but I can almost guarantee you no one is serving Lamb Vindaloo. This is what makes American Gymkhana a special treat for brunch. For $25.00+ tax & tip, you get your choice of an outstanding selection of some pretty darn good Indian dishes, and that includes one side item and two cocktails. Selections include things like Lamb Vindaloo, Angrezi Chicken, Gymkhana Club, and they even have a Gymkhana version of chicken and waffles and french toast. 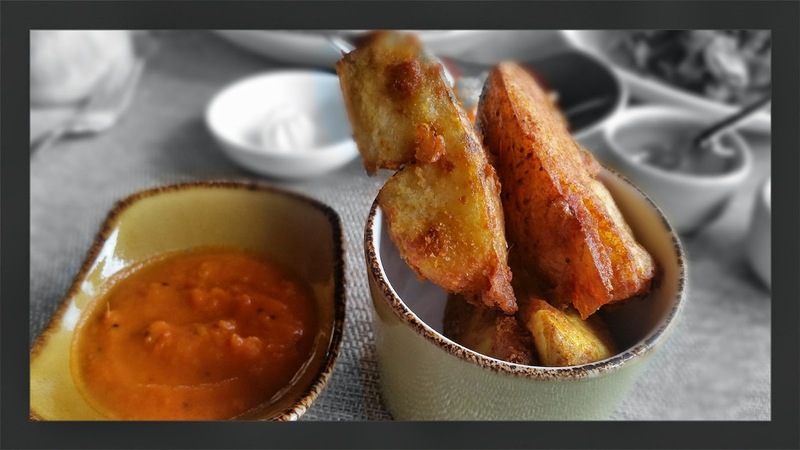 Side selections include your choice of masala potato wedges, black cardamom & hickory smoked lamb bacon, warm spice granola & berry parfait, daily bread basket and a kale & cashew salad. The cocktail choices feature an orange-mango mimosa lychee mimosa, peach bellini mumbai Bloody Mary. If you prefer something non alcoholic they also have brunch mocktails which are basically virgin drinks with freshly squeezed juices. If that was not enough, American Gymkhana also features a live DJ. Yes They have that too, because really nice groovy house music is always a great accompaniment to any meal. You can sit anywhere you like, but go for the veranda if its available. Its a great spot to eat, drink, relax and jam out to sounds of the live DJ. My wife ordered the Gymkhana Club. 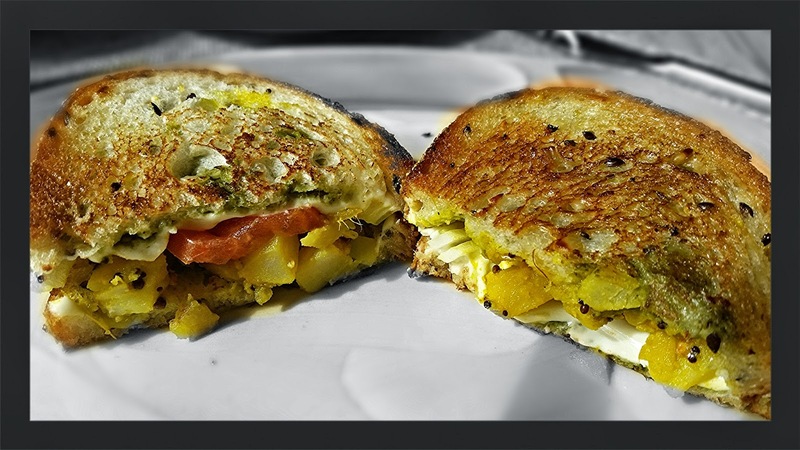 This is a sandwich made with sharp English cheddar, mint coriander chutney, spiced potato,red onion and tomato. Very delicious and unique. 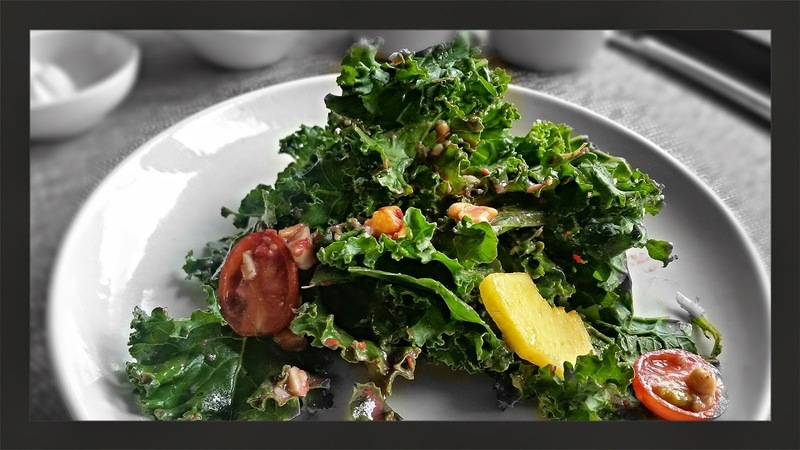 For her side, my wife chose the Kale & Cashew Salad. The salad was light and refreshing with light vinaigrette dressing. 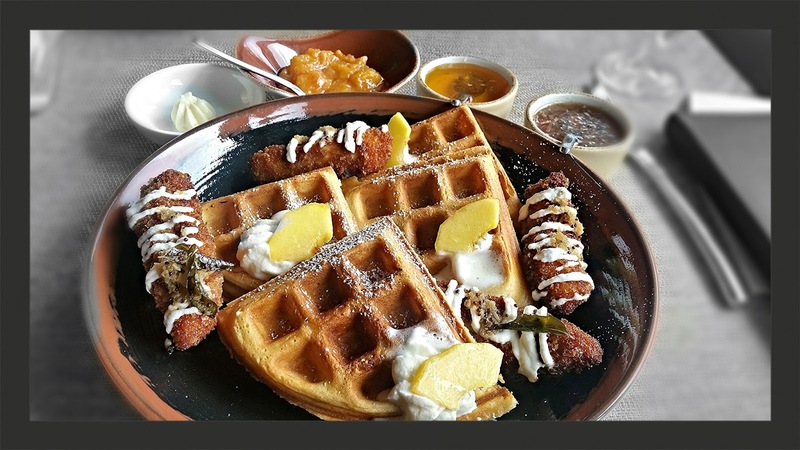 As a southern guy, I had to order the Banjara Chicken & Waffles with spiced fried chicken, garlic yogurt, a buttermilk tadka waffle and a variety of house made syrups and butter. This was simply outstanding. My side choice was the Masala Potato Wedges. Another twist on an American classic from Chef Aarthi Sampath. These wedges were lightly fried and crispy and full of flavor. 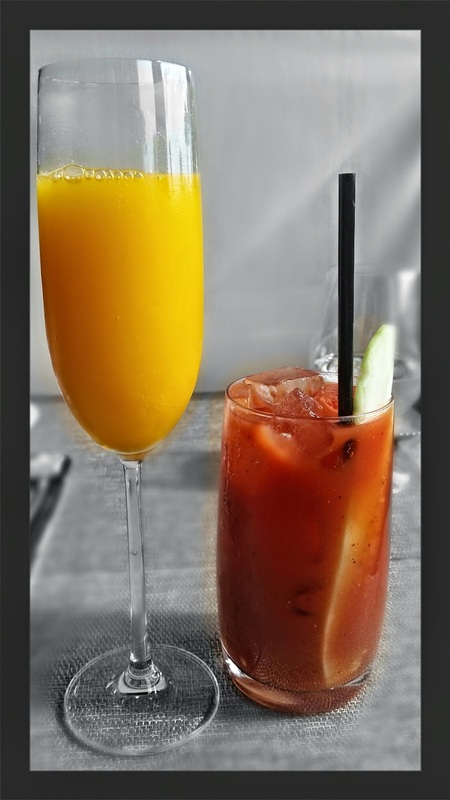 Our drink selection included an Orange Mango Mimosa and a Mumbai Bloody Mary. Both were very good, but the Mumbai Bloody Mary was a game changer. Hemant Pathak, the beverage director for Junoon in New York and for American Gymkhana, has created a couple of really good cocktails that set his tastes and standards apart from others. The Mumbai Bloody Mary is his version of the classic Bloody Mary, with a blend of house toasted spices and curry. By using other ingredients instead of the standard Tabasco or Worcestershire sauces normally used, this Bloody Mary mixture is one that you will remember. Its hot and fiery, but full of flavor. Flavor is the key ingredient at American Gymkhana. Whether you go for brunch or dinner, you will not be disappointed. Chef Sampath certainly knows what she is doing in the kitchen and she knows how to excite your taste buds. For $25.00+ tax and gratuity, this is one of the best brunch deals in Orlando.